Sentosa Island here I come! Right after Suu and I went to Universal Studios Singapore, we decided to explore a bit more since we were in Sentosa Island. A resort island with beautiful beaches, world class attractions, water sports and golf, Sentosa Island is easily accessible via cable car, taxi and monorail. There are 3 stations at the island if you are using the Sentosa Express; Waterfront (USS), Imbiah (Merlion) and Beach ( Siloso beach, Songs of the Seas, iFLY). Since we were already at the Waterfront station, we walked around and took some photos. M & M's anyone ? 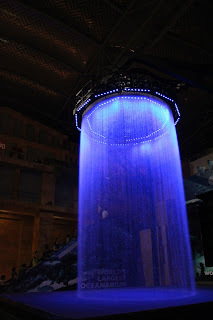 We then walked to the Lake of Dreams, which is a free light and water show at Sentosa's Festive Walk. It is a 15 minutes show featuring flaming dragons, laser and water displays. Featuring daily at 9.30 pm, Lake of Dreams is one of the most colourful shows around. During the show, the colours will change, representing elements of nature. Next on the list was the Merlion. Now, I am sure you must have seen the Merlion statue all over Singapore and must be wondering about it. Well, the legendary Merlion is a mythical creature with a lion's head and a fish's body. It serves as a guardian of prosperity; the lion head depicts the folklore of Prince Sang Nila Utama's discovery of Lion (singa) and City (pura), hence Singapore was named. You can see the huge 37 metre tall Merlion on Sentosa Island, and for a small fee you could walk all the way up to the head of the Merlion. Imbiah Lookout was where we next headed to. One of the main attractions here is the Skyline Luge Sentosa which offers 2 different types of rides which is the Luge and the Skyride. Luge is something like a go-cart where you can choose between the leisurely cruise or race down the 688 metre Dragon trail or the 628 metre Jungle trail. Once you get down the Luge, you will find that you have arrived at Siloso's beach. 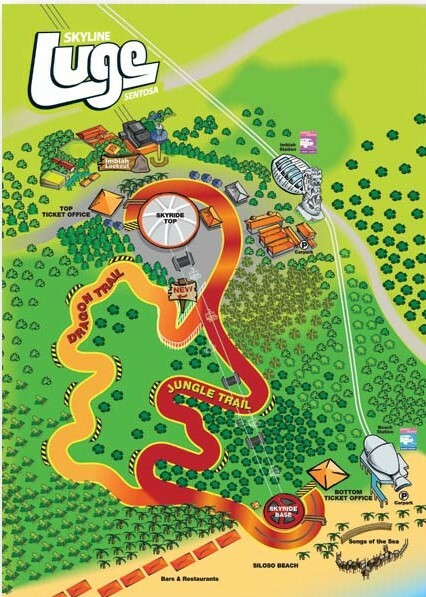 You could opt for a Skyride which takes you up the hill for another go at the Luge. We took a stroll along Siloso's beach which seem to be packed with tourists especially at night. Then, we took a Skyride back to Imbiah lookout, which was quite scenic as you can get the bird's eye view of Sentosa Island and Singapore city. On your marks, get set, Luge ! Next, we came across Images of Singapore. As we arrived there late evening, we weren't able to check the place out. Nevertheless, you can always check it out, as it displays Singapore's chronological history from day one to present. And if you do, let me know how it is like. Since there was still time, we headed to the stage for the crane dance performance. The show is held every night so be sure to catch the cranes before they fly away! The crane dance shows a journey of love between the 2 mechanical cranes, and how their love for each other transforms them into real birds. It is definitely a show not to be missed, if you ask me. I was pretty impressed with the stunning light and water effects of the crane dance. We then headed back to Vivo City for some dinner as we were quite tired and hungry. There were still a lot of activities which I wasn't able to cover whilst I was at Sentosa as I had limited time there. 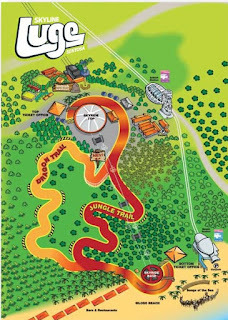 Any how, you could always check out all the activities here through their main website http://www.sentosa.com.sg/en/ Definitely a must-visit destination if you ask me. I wouldn't mind coming here again some day again. You sure it wont bite?